If you are over 25, YOLO likely means nothing to you. If you are under 25, you may be so familiar with YOLO that you’re already completely sick of it. A tip to the oldsters: YOLO is an acronym for “You Only Live Once.” It shot to fame earlier this year thanks to the rapper Drake, whose song “The Motto” has the hook, “You only live once, that’s the motto...YOLO, and we ’bout it every day, every day, every day.” After a video for the song was released in February, the buzzword spread quickly among the high school and college-age set by word of mouth, not just in person but through the turbocharged vehicle of social media. What accounts for the meteoric rise of YOLO, and how has it gone virtually unnoticed by nonmillennials? Its appeal to the youthful is self-evident. 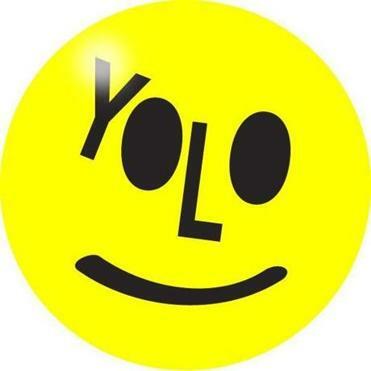 YOLO as a shorthand mantra defines youth, on a certain level. What is teenagehood if not the adventurous, often foolhardy, desire to test the limits of acceptable behavior—because hey, why not? YOLO! But as the term has circulated over the past several months, a YOLO backlash has set in. Jason Salcedo, a high school senior from Stuart, Fla., recently blogged that YOLO is now “used by teens only as an absolute justification to do dangerous or harmful things.” As he pointed out, those who use it might not appreciate that you only die once, too. Even as teenagers argue over the merits of YOLO-ing, their parents and teachers remain largely oblivious. Slang serves a powerful function for marking an “in-group,” as sociologists say, and it’s easy to see how YOLO would be precisely the type of term that its users would want to keep to themselves, away from elders. It’s true that if Couric and others of her age group start YOLO-ing, making the term synonymous with crossing items off one’s “bucket list,” any generational cachet it might have will be lost. But it would be somehow fitting if an expression encapsulating the joys and perils of youthful indiscretion burns out just as quickly as it blossomed. Vocabulary.com. He can be reached at benzimmer.com/contact.